I had a Rhodesian Ridgeback called Kaizer that recently died. He was 8 years & not sure how he died as he was healthy that morning. Apparently big dogs with deep chests are prone to bloat and heart failure. He was fantastic with other pets and my babies and toddlers (although his tail would knock them down when excited). He never dug or destroyed anything in the garden and adapted very well to our quiet lifestyle. The only challenge we had with him was his excitement with visitors (who said Rhodesian Ridgebacks were aloof??). Overall a very handsome, gentle, calm, loyal and sweet natured dog who is low maintenance and happy just to lay about at home and be part of the family. Kaiser was certainly a handsome dog (loved his picture). He also had a great name. 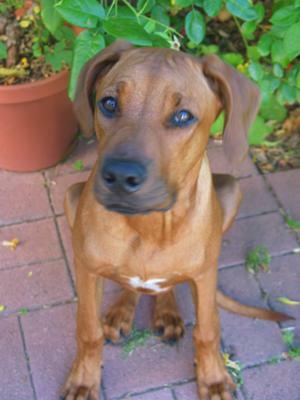 It is nice to hear that Rhodesian's personalities are so companionable. It is sad too that you lost him so soon. Eight years is not enough time when you don't think of losing a big dog until at least 11 or 12 years. We are simply not given enough time with the good ones.